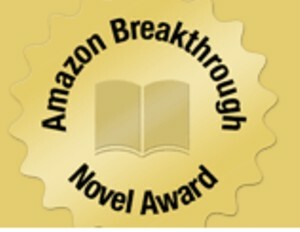 The six finalists for the 2012 Amazon Breakthrough Novel Award have been chosen. Interesting. There are only two categories, general fiction and young adult fiction. The general fiction finalists are all men, and the young adult fiction finalists are all women. What does that say? Probably nothing. I read the excerpts of the general fiction entries and they were all good, and all had a hook and all made me wonder what would happen next. But since I don’t have access to the entire manuscripts, I am basing my reviews on the first few chapters of each one. Then I’m going to predict the winner, based on which I liked best, which is going to be difficult because I liked all three, but didn’t love any of them. The Beautiful Land by Alan Averill. This starts out with a great first line hook. Tak can’t answer the phone because the noose is too tight. Great, I like that. The deal is, Tak has decided to do himself in and has set up this elaborate suicide event, but the ringing phone distracts him. It turns out to be a strange call, but so interesting that Tak decides to put his suicide plans on hold. Next chapter we meet, Samira who is suffering from PTSD and tells her therapist that Tak was her friend from high school, but that he killed himself four years earlier. But wait, he didn’t kill himself, so what’s going on? That’s another hook. That, of course, is the end of the excerpt. It’s interesting that many authors are using present tense, which never used to be done much. I like it. I believe this book is going to veer off into a nearly sci-fi genre, including time travel and alternate realities so I don’t think it will be something I would ultimately be too interested in. And I found a really bad metaphor. A clock ticks softly from Carrington’s desk, muffled under a pile of paperwork like the beating heart of a boarder in a Poe story. Do you hate that as much as I do? Classic case of TTH. (Trying Too Hard). Grace Humiston and the Vanishing by Charles Kelly. This one is a historical mystery which takes place in 1917. It is fiction, but based on the true story of Mary Grace Winterton Humiston. I am curious to know why she felt that way. I believe I would enjoy this book, and I found no distasteful metaphors in the excerpt. A Chant of Love and Lamentation by Brian Reeves. This had a good opening line too, similar to the first entry. These are the last minutes of Charlie Kalenhano’s life. Charlie is on some terrorist mission, perhaps suicide bomber in Hawaii, as part of a plot to regain Hawaiian independence. The excerpt doesn’t explain it. That must come later. It’s well written and I was mildly curious to know if the bomb went off or not, since Charlie had a few problems on his way to detonate the device, which is in the trunk of his cab. Bad weather, a fender bender accident, locking himself out of the car, late to arrive, etc. The excerpt, while good enough, didn’t grab me sufficiently to get me excited about reading the book when it is finally published. Actually I liked the entries last year better than these, but my pick is Grace Humiston. We’ll see. I haven’t had the chance to look at the finalists, so it was nice to read your post and discover you’ve done much of the work for me. 🙂 I enjoyed your take. It will be interesting to see who comes out the victor. Of course, all of them deserve congratulations on making it this far. Really a great accomplishment. I like this contest. It is a great way to get writers enthused, have entered it myself twice. I guess you don’t have to ask how that turned out. I haven’t had the time to look at any of this years entries so this is a nice summary. We shall see if you are right! Last year I was 0 for 2. Seems the judges and I didn’t agree so yes, we’ll see. Thanks Elliot.